The NFL Draft has come and gone with minimal fanfare. Overall, it can be agreed that the talent pool for this years class wasn’t as awe-invoking as in years past. 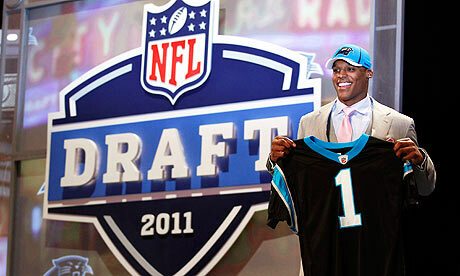 Much of the debate came at the top of the Draft with the selection of Cam Newton who many felt would go (and eventually did) go #1 overall to the Carolina Panthers. As the Draft progressed we saw a lot of movement via trade with multiple teams jockeying for picks and movement either up or down in rounds. So who were the Big Winners and the Big Losers of the Draft? Let’s see. The Lions were surprised that highly-regarded Defensive Tackle Nick Fairley fell to them at #13 and took advantage by selecting the defensive stud who seemed to have fell off other teams draft board due to some troubling interviews. Lining up last years Rookie of the Year Suh with Nick Fairley and All-Pro Kyle Vandenbosh poses a tough task for other teams Offensive Lines. Good luck blocking that tandem. The Bengals got a stud Wide Receiver in Aj Green who the Atlanta Falcons tried desperately to trade up for. This indicates that the Bengals are ready to supplant Chad Ochocinco and Terrell Owens and rebuild with an infusion of “team guys”. The Bengals continued to address many of their needs when they nabbed TCU Quarterback Andy Dalton in the 2nd Round. Preparing themselves for the imminent departure of Carson Palmer the future looks bright in Cincy. The main factor is the drafting of “team players” who are proven workers shows the Bengals want a new culture in Cincy. Adding all defense almost the entire draft proved to be a very intelligent move from the front offense. Marcell Dareus will be a stud. No flashy picks. They added players with a lot of potential and plugged a lot of holes without having to rely on Free Agency. Many may question the Running Back selection they made with Jimmy White in the 5th but with many teams reverting to a Running-Back-by-Commity system this proves to be smart. Now they aren’t necessarily tied to large contracts with Jackson and can part with him via trade. The fact the Dolphins didn’t take any Quarterbacks in this draft speaks volumes. They took solid “need” players and I love the Pouncey pick at #15. For years the Dolphins have had issues with the Center position and this should help alleviate those issues. The Dolphins continued their strong draft with the selection of Daniel Thomas in the 2nd round after trading up. Thomas is a big runner who can bring more power to the Dolphins run-first offense. With the departures of Ronnie Brown and Ricky Williams on the horizon it was key to get a featured back with some true meat & muscle to help bulldoze in Miami. They also addressed the Deep Threat need at Wide Receiver with blazing runner Edmund Gates. Gates is a speed demon who has hit 40 times of 4.21 before. With some coaching he should develop nicely and add a viable threat to the Wide Receiver corps. Really Minny, let’s lay off the Quarterbacks. You obviously have no clue how to handle the Quarterback position. GM Rick Speilman has a track record of mishandling his quarterback decisions (see his track record in Miami). They reached extremely far for Christian Ponder who has had comparisons to Chad Pennington. While Pennington wasn’t a bad Pro, he had the inability to stretch the field at times. With Ryan Mallet on the board they could have selected him or picked up more draft picks by trading out of the #12 spot. Wonder if they researched Andy Dalton at all?!? You have a glaring need at QB and obviously Free Agency and Trades have not worked out for you at all. You had a chance at Dalton, Mallet and Blaine Gabbert but failed to make the proper selection. Only time will tell just bad this move may have been for the Redskins. The Falcons are losers for the simple reason they gave up a ton to move up in the Top 6 to attempt to nab a stud Wide Receiver. The problem is that the stud receiver they traded up for (Aj Green) was already off the board. So what they decided to do was continue to give up a fortune to move to the Top spots to nab a questionable Wide Receiver in Julio Jones. While Jones may be a solid receiver he has a lot of issues with his hands which as a Receiver is troubling. He has all the assets but is only projected to be a #2 receiver at best. So they question here is …why give up that much for a receiver you didn’t have in mind and with as many question marks at Jones has. That wraps up SportsRantz.com’s analysis of the 2011 NFL Draft. You can view our Pre-Draft Mock and this Draft Grading in the future to see just how well we did or didn’t fare in our projections and opinions.